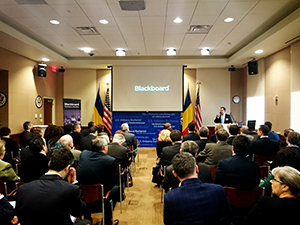 The company has had a huge success in the presentation of the e-learning platform Blackboard before rectors of universities and representatives of the Government of Romania. On March 30th 2015 a business breakfast was held at the American Embassy in Bucharest, which brought together more than 50 representatives of senior management of the Romanian universities and representatives of the Romanian Government. The purpose of the breakfast, which was held under the motto “Reimagine Education”, was not only to acquaint the guests with the e-learning platform Blackboard, but also to give them information about funding opportunities and all related services of Ballistic Cell. Before the actual breakfast, presentations were made by Mr. Veselin Petkov – Sales Director of Ballistic Cell, Mr. Peter Panek – Regional Sales Manager of Blackboard for Eastern Europe and Russia, and Mr. Yulian Petkov – General Manager of Ballistic Cell. Dan Peters, who is a senior manager, solutions engineering and has worked for Blackboard for more than nine years, took part in the subsequent Q & A session by answering questions by the guests. Blackboard provoked great interest in everyone present, many questions were asked and the topic remained open for further discussion at the scheduled upcoming meetings. We thank the US Embassy in Bucharest for their hospitality, professionalism and support!